Suffice to say the staff and Hotel were so good we are going back this July for two weeks. We stayed at this hotel after a 7 day Nile cruise as a twin centre with Thomson. We had a problem when we first arrived, we had been allocated a twin room though we had asked for a double, upon seeing the room we immediately asked at reception if we could get a double instead and they were very accommodating and moved all our bags for us while we attended our welcome meeting. The hotel was quite clean, cleaners were always visible and the rooms were cleaned everyday. Breakfast was served in the blue sky cafe (near reception)there was a good variety of hot food, fruit, bread, pastries, cereal and yogurt, though be careful because the yogurt is plain, not fruit! We used the beach side hut for food most lunchtimes, you just put up a little flag attached to your table then a staff member comes along, takes your order then brings the food and the charge slip within about 30mins. they also come take away all the rubbish when you have finished. The food from here was very good, I can recommend the toasted chicken sandwiches and cheese burgers!! We only ate at the fish restaurant one evening as it was very expensive, but well worth the cost, it was the best fish meal I have ever tasted!! The location was as good as any other hotel in hurghada, has a few shops and restaurants in the vicinity, but you have to get a taxi to the proper "town" do visit hard rock cafe, food is the same as all the others but the staff perform songs and dances! I didn't see any of the hotel entertainment as we went every evening we were there. 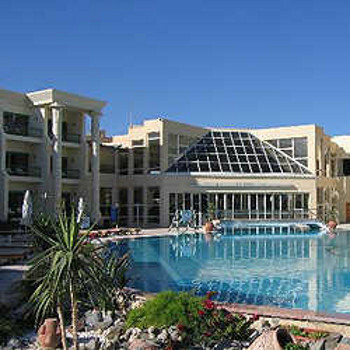 We stayed at the Hilton Hotel,Hurghada. It is a low rise 4star set-up. The appartments are all around a stunning internal garden,leading to an immaculate private beach. For divers,this place is fabulous. The in house 5star PADI diving school is superb. We both learnt to dive there. The pontoon and boats and equipment are all on site. The staff are faultless in serving. Every day, the cleaning was discreet and immaculate. They even, usually, left a towel folded in a shape of a swan with a flower in its mouth! I need to get more under the Hotel banner! This hotel is an absolute paradise. It is low rise,only two floors,discreet,has stupendous gardens with all accommodation over looking them. The private lagoon has great food, a hammock, umbrellas,kids stuff,clean sand and great diving facilities and school all on site. I truely cant imagine a better looking setup for a relaxing/diving/pleasant holiday in gauranteed sun. The egyptians are all charming and gracious.Tip the one you like a fiver. Thats half a weeks wages for some!Most work in hotels to feed families living in slums ,etc in Cairo etc. Make sure your accommodation is within the gardened Hilton Hotel that leads to the private beach, and not across the road form the Hilton Hotel entrance,with shared facilities. The naming of several resorts can make it confusing.This pardise is 4star and through the Hilton doors themselves. There is a pub and club on site, but its hardly London. There is a great restaurant onsite,but is as pricey as England.